We are now only a few months away from the Grymkins for Warmahordes. So looking on element games to see whats going to be available on the 27th July. A perfect entry point for new players and an amazing value for seasoned vets looking to start a new faction, this All-in-One Army Box contains everything you need to quickly field a complete and competitive army suitable for every battlefield engagement—from casual games at home to organized leagues and tournaments. 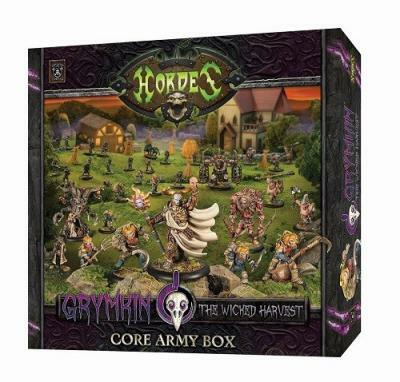 The conveniently sized rulebook containing the full core rules, along with the included strategy cards, will equip you with all you need to lead your army to victory! The 50-point Grymkin army includes: 1 Heretic, 1 Skin & Moans Heavy Warbeast, 1 Gorehound Light Warbeast, 1 Cage Rager Heavy Warbeast, 1 Hollowmen & Lantern Man Unit (11), 1 Piggybacks Unit, 1 Dread Rots Unit (10), 1 Lord Longfellow Solo, 1 Wytchwood Solo. This set weighs in at a rather respectable £159.99 so it might not be the best option for some. If you would like to see more work in progress by the team you can follow our Facebook page, and we are trying to raise funds for more site upgrades and recording equipment on Patreon as well. Adeptus Titanicus – Is the Cost of Battle Too High? Way of the Samurai (Infinity new release).